Abuse is wrong. You don't deserve it. Nobody has the right to do it to you. In marriages and relationships abuse isn't always a slap or a punch. It can be verbal or psychological. The abuser's goal is to hold you hostage emotionally and physically. This site is where you can learn what abuse is all about and the damage it does. Your first step out of the darkness is there for you to take and there are a lot of people who will help you take that step. There are many misconceptions about abuse...by the victims. The two biggest are that what's happening to you is your fault and that you are the only one who this is happening to. All thinking this way does is create a fear to talk with anyone about what's happening to you or a refusal to look for ways to make it stop. The first step to safety and a life you can call your own may seem like trying to take a step over the Grand Canyon. The reality is that thankfully many other women have taken that step before you and are there to cheer you on and celebrate as you reclaim your life. What you'll find here is a collection of information that will provide a better understanding of domestic violence and its victims. You'll also find some of the best organizations to turn to for support, guidance and the courage to take that first step. Georgia Durante is one of Hollywood's leading stunt drivers who owns her own company which supplies and coordinates car stunts for many TV shows, movies and commercials. Georgia is also a survivor of an abusive relationship and life threatening times. 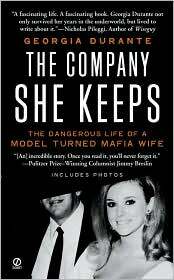 She shares her story in her best selling book The Company She Keeps of being married to a member of the mob who physically and mentally abused her, her modeling career, her experiences with a stalker and on top of everything else...her survival and rebirth as her own stronger person. If you are in an abusive relationship you do have choices and options. It's up to you to take that first step to reclaim your life. Is someone hitting you? Is someone cutting you off from your family or friends? Is someone constantly yelling, swearing and belittling you? You can make it stop! The hurdle in front of you is only as high as you imagine it to be. The first step is to share your thoughts and fears with someone. If you click the link below, you can send an e-mail, as anonymous as your e-mail address will allow, directly to Georgia Durante. Chris DeBello and Georgia personally guarantee that Georgia and only Georgia will read the e-mail. Whether you want guidance on what to do to start to get out and move on, what to do next if you've already made the break or if you've escaped the abusive relationship and want to share your story with Georgia.